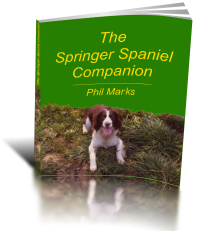 Springer spaniels fill many roles – I have even seen one being used to herd pigs! Mostly though, people think of them as being used for hunting – flushing and retrieving game. However, their exceptional noses, their agility and their high work rate, in combination give them a clear advantage over all other breeds. Also, they are compact in size. Imagine for a moment a survivor, trapped in an earthquake shattered building. The last thing such a person would want to see would be the nose of, say, a big German Shepherd dog poking through the rubble. That of a springer spaniel would be muck less intimidating. 1. Explosives detection – a front line job finding buried roadside bombs, for example, they are widely used by the British Army. In a civilian role – security scanning – checking venues for concerts, sports events and so on where VIPs might be in attendance and explosives might be present. 2. Drug detection – they are used by the police, Customs and Excise, FDA and other agencies for checking cargoes, searching ships and planes, trucks, buses and cars. 3. Protecting wildlife – specifically, seeking out specfic endangered species – such as penguins – so that their population can be montitored. 4. Recently, it has been reported that they can detect lung cancer by smelling a sufferer’s breath. How this will develop in the future, who knows? 5. Tracking missing persons (though other dogs may also be used for this). 6. Detecting dead bodies – for example where a murder victim might be buried in the vicinity, the springer can find the exact location of the body. 7. Finding bodies underwater by detecting the smell on the surface of a lake or river. Amazing! I’m sure that there are other uses, but it’s a shame that so many of these are linked with criminality, death and destruction!